Junior Izzy Carroll scored a team-high 16 points and grabbed eight rebounds in Platteville’s 52–44 upset of seventh-ranked and previously unbeaten Prairie du Chien Saturday afternoon. POSTED February 21, 2019 1:48 p.m.
Platteville’s Southwest Wisconsin Conference championship dreams went by the wayside with a 62–45 loss at Richland Center two weekends ago. That didn’t mean Coach Mike Foley’s Hillmen didn’t have anything left to play for in Saturday afternoon’s makeup game when SWC champion Prairie du Chien came to town. Junior point guard Josie Nies hit a pair of clutch 3-pointers late in the second half to help Platteville rally from a 10-point second half deficit to defeat the seventh-ranked Blackhawks 52–44, spoiling Prairie du Chien’s bid a perfect regular season. After Ella Hager made a 3-pointer with 6:37 left to give the visitors a 44–39 lead with 6:27 left, Nies drilled a 3-pointer to make it a one-possession game at 44–42. Then, after classmate Izzy Carroll split a pair of free throws, Nies drilled the go-ahead 3-pointer from the left wing to give the Hillmen a 46–44 lead with 4:03 left. It was Platteville’s first since it was 16–14 early in the second half. The Hillmen never looked back and closed the game on a 13–0 run stunning the Blackhawks and their fans. Nies finished with 15 points on an ultra efficient 5 of 7 shooting, including 3 of 5 from 3-point land. She also assisted on seven of Platteville’s 20 made baskets in the game. Carroll added 16 points on 6 of 8 shooting and added eight rebounds. Junior Becca Hoyer finished with 14 points and two steals. Junior Sami Martin returned to the lineup after missing the past three games — including the loss at Richland Center — with a head injury and was predictably rusty. She finished with five points in 2 of 7 shooting, and nine rebounds, but was also in foul trouble in the second half. Six-foot-2 senior center Gabby Ritchie, a Division 2 Minnesota–Moorhead recruit, scored Prairie du Chien’s first six points and dominated the first 12 minutes of the game, scoring 13 of her game-high 17 in the span. Sophomore Macey Banasik scored on a drive to the hoop and drilled a 3-pointer — one of PdC’s eight from long distance — to give the Blackhawks a 28–20 lead with 4:37 left in the opening half. But Carroll scored on a breakaway layup, then drilled a 3-pointer from the corner on a set play and Martin split a pair of free throws with 6.4 left on the clock as Platteville closed the half on a 6–2 run to pull within four points at 30–26. Ritchie scored in the paint a minute into the second half, but that would be her final basket of the game. Freshman Lilly Krahn made back-to-back 3-pointers four minutes later as the Prairie du Chien lead ballooned to 38–28 with 13 minutes left. But less than a minute later Krahn picked up her fourth foul and went to the bench. The Prairie du Chien offense lost its rhythm without its leading scorer. The Hillmen smoother Ritchie in the paint and forced the Blackhawks to take long contested jump shots. Prairie du Chien made just two 3-pointers the rest of the way and did score the final 6:27 of the game. Platteville shot a sizzling 64.5 percent (20 of 31) from the field, including 5 of 7 from beyond the arc. The Blackhawks fell to 18–1 overall and finished 9–1 in the SWC, while Platteville improved to 17–4 overall and finished second in the SWC at 7–3. But more importantly may have won an important physcholgoical battle, should the two teams meet again in the WIAA Division 3 sectional semifinals, should both teams advance that far. 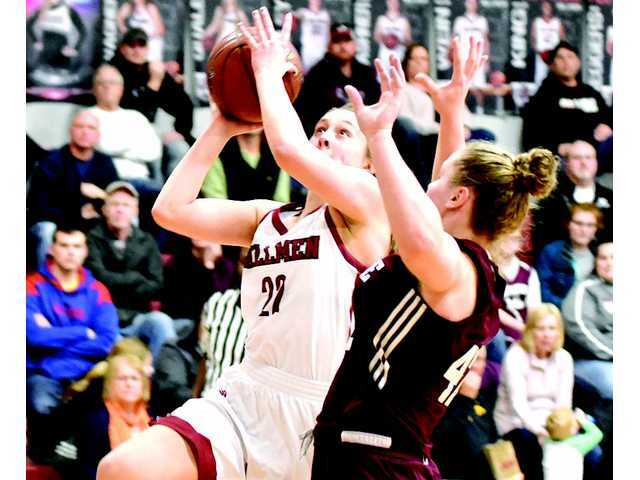 Prairie du Chien (18–1, 9–1) — Lilly Krahn 9, Ella Hager 3, Macey Banasik 10, Gabby Ritchie 17, Allison Riebe 3, Allison Allbee 2. Totals – 18-45 0-0 52. Platteville (17–4, 8–2) —Becca Hoyer 14, Josie Nies 15, Sami Martin 5, Izzy Carroll 16. Kaycie Wagner 2. Totals – 20-31 7-18 52. 3-point goals — PdC: 3 (Krahn 2, Ritchie 1), P: 5 (Nies 3, Carroll 2). Total fouls — PdC: n/a, P: n/a. Fouled out — PdC: Krahn.